Hello! Happy Friday! It is graduation season, and my friends' son is graduating from high school, so I made a card for him. I started by stamping Grad A la Carte on Choice Buttercream cardstock and paper pieced the letters. My patterned papers are from the fun Summer Fresh collection. Since this is for a boy, I went with primary colors and Kraft and kept the frills to a minimum. I added a border using the Reach for the Stars Border Die and a few corrugated cardboard stars (using the Seeing Stars Dies). 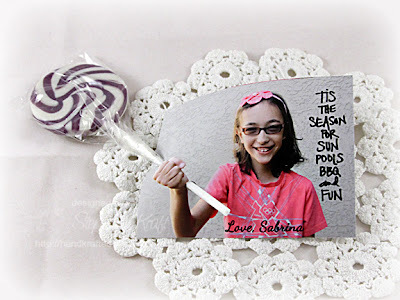 My main sentiment panel is cut with the Gift Card Frame Die. I made this card last weekend and happened to break my sewing machine needle and couldn't find another one in the house. Since I didn't want to run out to the store (and really thought this needed stitching on it), I hand stitched around my card (using some perle cotton thread). Accessories: Reach for the Stars Border Die, Seeing Stars Dies, Gift Card Frame Die (Taylored Expressions); Twine (May Arts), Foam tape, Perle cotton thread. 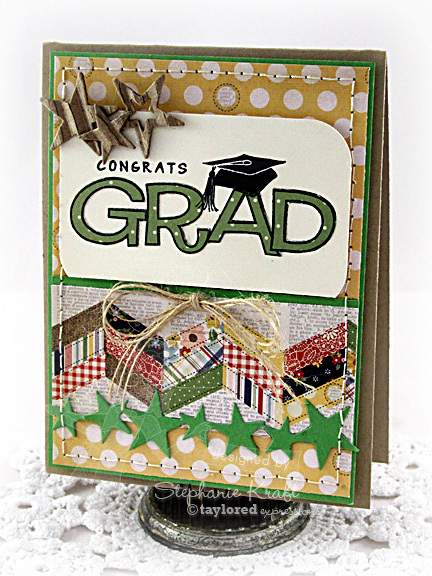 A really super card for a young man - love the shades of green! Super photo of Sabrina - she's quite the young lady! What a great graduation card Stephanie! 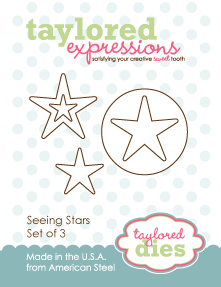 Love the star border and fun patterned paper! Your had stitched border looks great! Love the little lolli pop treat featuring that sweet photo of Sabrina! What a great idea! Wonderful card! I love the layout and colors. Cute treat card too! Really great graduation card Stephanie! Love the colors!